This is somewhat subjective but in doing my research, I have seen a lot of patents that were accepted in other countries (e.g. China, Australia) or in PCT later get accepted at the USPTO with what seems to be a reduced amount of investigation from the examiner. Some were accepted on the first try according to PAIR. While I know this is not uncommon for patents, a lot of these foreign patents make very broad and already published claims that can easily and unarguably be shot down with just a 2-minute google search. I'm guessing that they were accepted in their country of origin because of less stringent examination and then people here accepted them because they assumed someone else had done the bulk of the job. Is there any truth to this anecdote? Would USPTO be aware of this if it ever came down to a re-examination request? 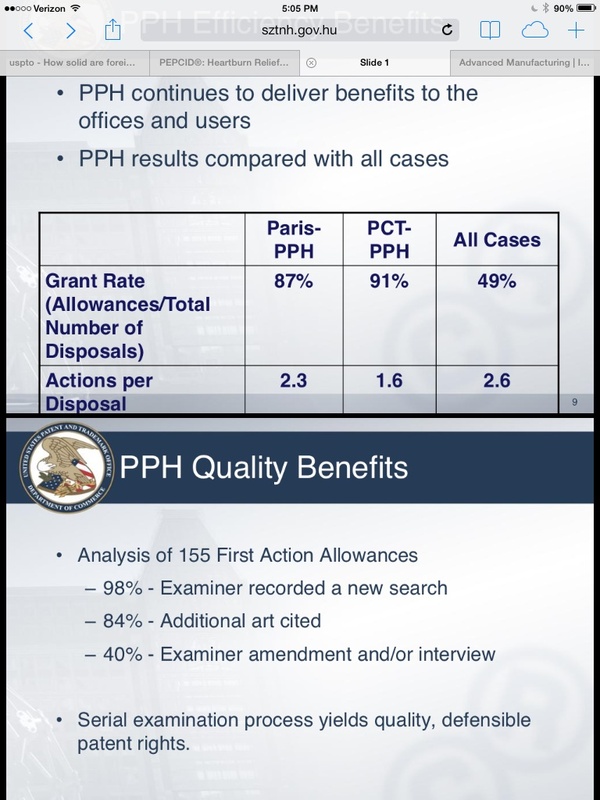 For the PCT PPH the allowance rate is about double the average allowance rate and the average number of actions also drops. It takes one action to say "yes" so 1.6 actions means only .6 hear an initial no. On the other hand the next slide shows that the US examiners are doing something. A huge point is that this is not just for foreign applicants. If a US applicant files in the US and a PCT, they may get a positive prelim examination report from the PCT while the US case is still in the queue. They can petition the US to accelerate the corresponding US application under PPH. I have had two applications that had all claims allowed right out of the box -it is a shock. They included a PPH case and a "regular" case. In both instances I was concerned, wondering if I had received a thorough examination and also wondering if I had left something on the table. Regarding reexamination - reexamination proceedings are all done by a separate group from the initial examiner. I recommend applicants take yes for an answer and put the patent in their pocket - and seriously consider filing a continuation application that is not accelerated as a safeguard. Not the answer you're looking for? Browse other questions tagged uspto foreign or ask your own question. How do I find patents owned by a a given university for a given topic programatically?